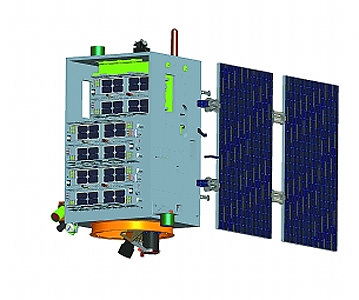 XPNAV 1 (X-Ray Pulsar Navigation) or Maichong Xing Shiyan Weixing is a Chinese minisatellite to test autonomous spacecraft navigation and a more precise deep-space navigation by using the signals of X-ray pulsars. X-ray pulsar navigation is an innovative navigation technique wherein periodic X-ray signals emitted from pulsars are used to determine the location of a spacecraft in deep space. Current ground-based navigation methods are limited by the time delay between spacecraft and the Earth. However, for certain type of pulsars, called "millisecond pulsars," pulses of radiation occur with the regularity and precision of an atomic clock. As a result, in some scenarios, the pulsar X-ray can take less time to estimate a location. This leads to more precise measurements of a spacecraft’s location. As X-rays from pulsars are absorbed by the atmosphere, scientists have to test this technique in space. This satellite is to detect the details of X-ray signals of 26 nearby pulsars, and to create a pulsar navigation database. This target could be achieved within five to 10 years. The satellite was launched in November 2016 on a CZ-11 rocket from Jiuquan.